Fire King glass is a pressed oven glass similar to Pyrex. Manufactured from the early 1940’s to the 1970’s by the Anchor Hocking company, this affordable collectible glassware can be found at thrift shops, flea markets, and yard sales at very reasonable prices. An eBay search for Fire King Glass will produce thousands of results for this popular glassware. Fire King dinnerware, bakeware, and other dishware was often given as a premium in bags of flour or given away at gas stations. It could be purchased at grocery stores, dime stores and hardware stores. Attractive, durable, and inexpensive, Fire King glass was intended to be multi-functional. Covered casserole dishes could be used to bake and serve, and then store the leftovers in the refrigerator. Loaf pans and utility trays were often sold without mentioning a particular use for the item. 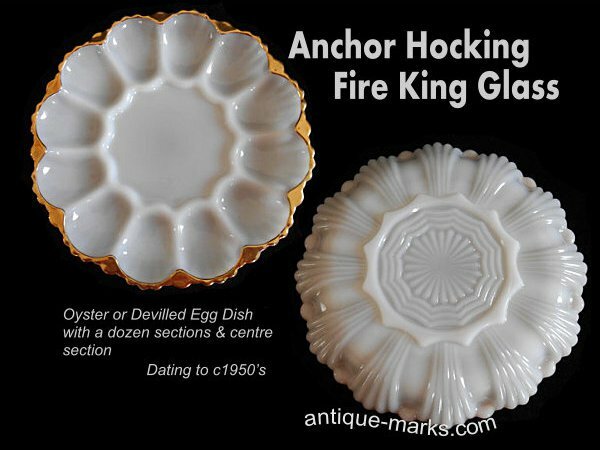 Anchor Hocking also produced baby bottles, cosmetic containers, ash trays and souvenir items from Fire King glass. This collectible glassware comes in many colors and patterns. Some lines are solid glass in opaque colors: white, ivory, turquoise, creamy pink (rose-ite), light green (jade-ite) and pale blue (azure-ite). Other Fire King glass lines have fired-on coatings over crystal, in pastel shades of blue, green, peach, or yellow, or bright yellow, blue, orange, or green. White glass lines were often decorated with decals in natural, floral, or geometric patterns. Some of the most popular decal patterns include Primrose, Anniversary Rose, Wheat, Blue Mosaic, and Forget-Me-Not. Philbe and Jade-ite became the signature patterns of Anchor Hocking Fire King Glass. Philbe has a raised pattern and was manufactured between 1942 and 1956. At first it was produced in clear glass, then later as Sapphire Blue and in jadite and ivory colors. Jadite is a generic term for the jade-colored glass produced by many manufacturers of the era. The light green color often varied since it was made from used beverage bottles and slag (junk) glass from other workstations. Fire-King called their version “Jade-ite” and also produced a thicker line of dinnerware that would hold up to the rigors of restaurant use. Jade-it Fire King glass was their most popular line, selling over 25 million pieces in the first six years of production. 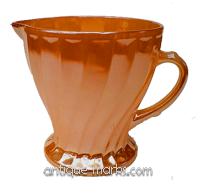 Many baby boomers will recall their grandmothers’ Peach Lustre dinnerware. This pattern is also one of the most well-known and widely collected of Anchor Hocking’s Fire King glass products. Peach Lustre is an iridescent peach color with a mirror-like finish and was applied to different styles of Fire-King dinnerware. Most Fire King glass lines are embossed on the bottom. The mark may read Fire-King in block letters or in script, or may include an anchor logo. The marks changed over time, and later pieces were not marked but had a removable sticker, which usually were removed by the purchaser. 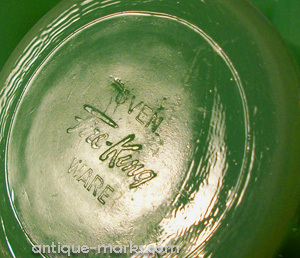 As fire king glass molds wore out and were replaced, the embossing was often not added to the new mold. Some older molds would still be in use as the new ones were put into production. The result was that authentic Fire King pieces made at the same point in time may or may not be embossed. This doesn’t mean they aren’t true Fire King glass or that their value is any less. Jade-ite is the most prized with Fire King glass collectors, which has led to the market being flooded with reproductions and “fantasy” dishware from Asia. A reproduction is a copy of the original, and a fantasy piece is one that was never in the line of the original manufacturer, but is designed to look like something they might have produced. Unscrupulous dealers may imply that these reproductions or fantasy pieces are vintage or antique. Modern Chinese restaurant ware in jadite is often marked with a clear decal that reads At Home International MADE IN CHINA and include a bar code. These stickers are easily removed. 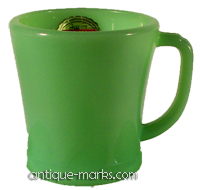 In 2000, a re-issue of Jadeite restaurant ware was attempted, but halted indefinitely due to quality issues. These pieces were manufactured in Brazil, and some have found their way into speciality shops. They are stamped with the date and have a foil label. It can be difficult for novice collectors to tell the difference between a true piece of Fire King glass and a reproduction. Get to know the background and reputation of collectible glass dealers you are considering buying from. Check the feedback ratings of sellers before buying Fire King glass from online auctions. Knowledgeable collectors who have been ripped off will say so. Once you start collecting Fire-King glass, the basic styles will become easy to spot. Do some research before beginning your collection. There are so many different beautiful patterns and colors that you may be a bit overwhelmed at first! Some collectors will add miscellaneous pieces to their collection, while others will try to collect enough of a favorite pattern to create full place settings for their table. You will be surprised how easy it is to find Fire-King glass at rummage sales, thrift shops, flea markets, and estate auctions, often for a mere pittance. There may be some in grandma’s attic, or still in her china cabinet. You can fill out your collection through online auctions sites if you need to. Fire-King glass was meant to be used on a daily basis, so naturally some pieces will show signs of wear. Look the piece over very carefully. Run your finger around the edges of the piece to check for chips. Hold it up to the light to make cracks more apparent. Avoid dishware that shows excessive scratches from eating utensils. The finish should be shiny and decals intact. Some pieces may have defects that were produced during manufacturing, but if the piece is in excellent condition otherwise, these small defects can be overlooked. Take care of your Fire King glass by washing it by hand. Using an automatic dishwasher will remove a minute layer of glass with each cycle, giving the glassware a dull, permanently etched finish (sick glass) and will eventually remove the Anchor Hocking decals. Remember Fire King glass was never meant to be used on top of the stove. And finally; although Fire King glass is made of oven-proof glass, there were no microwaves in existence when it was first manufactured and it is not recommended for microwave use.